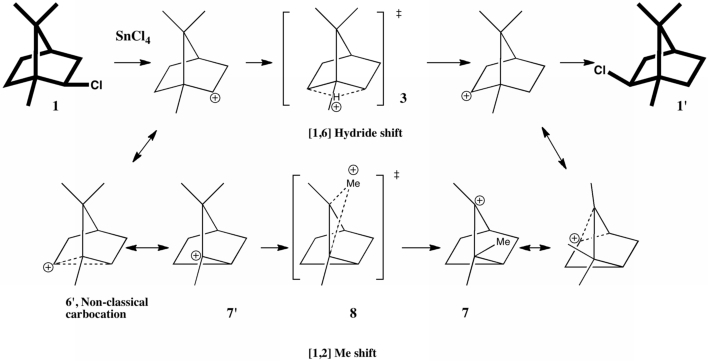 Meerwein himself suggested (in effect, since he lacked the modern terminology used here) that the reaction proceeded via a hydride shift 3, which was acting as the mirror in reflecting 1 onto 1‘. A few years later, isotopic labelling studies demonstrated that another pathway occurs, at more or less the same rate. This alternative proceeds via a series of [1,2] carbon shifts, with the mirror now being 8 rather than 3. I have documented the story in detail in an article that will shortly appear in the J. Chemical Education (DOI: 10.1021/ed800058c). There, calculations reveal that the two transition states, 3 and 8 (which the experiments above suggest should be almost equal in energy) in fact differed by ~8 kcal/mol in favour of the latter for a gas-phase model which does not include the counterion. These calculations were done at a level (B3LYP/cc-pVQZ) which indicates that 8 kcal/mol represents a real discrepancy not so much in the calculation as in the model used for that calculation. I suggested that perhaps the discrepancy might be due to tunneling effects in the hydride transfer reaction, accelerating that pathway compared to methyl transfer. What was missing from that particular model was the counter-ion, which is supposed to form an intimate ion-pair with the carbocation in moderately polar solvents. How much does the presence of such an object perturb the transition states? To find out, we need calculate such systems (which by definition have very large dipole moments) with inclusion of solvation corrections. Now that new algorithms for computing transition states with solvation have made this a routine calculation, I can report an update to these results. This was done at the B3LYP/cc-pVTZ (aug-cc-pVTZ-pp for the Sn) level, using dichloromethane as a continuum solvent. Without the SnCl5 counterion, 3 and 8 differ by 5.4 kcal/mol in free energy (this difference now includes all the solvation free energy terms), and in the presence of the counter-ion this remains unchanged at 5.4 kcal/mol (see DOIs 10042/to-3668 and 10042/to-3667 without SnCl5 and 10042/to-3670 and 10042/to-3665 with). The free energy of activation with SnCl5 (see DOI: 10042/to-3695 for starting material) is 16.6 kcal/mol (for the [2,6] H shift) and 11.2 kcal/mol (for the [1,2] Me shift), which indicates a facile room temperature reaction (as indeed is the case). What are the implications for this result? Modelling an (intimate) ion-pair is different from that of covalent compounds in one respect. Whereas the geometry at covalent atoms is very well established and largely predictable, ion-pairs are potentially much more flexible. In other words, it is nowhere near as obvious where to place the counter-ion. In the above diagrams, the SnCl5 is located at a reasonable position, but there are other positions where it could be. Although what is shown is an energy optimized structure, a full search of all the possible positions that the SnCl5 could adopt has not been undertaken, and the possibility must remain that another pose of the ion might be lower in energy, for either of the two transition states. Indeed, if it turns out there are many positions for the ion of very similar in energy, then the entropy of the system would have to be corrected for these microstates. Nevertheless, one can draw insight from the two structures shown above (click to animate the transition mode). The counter-ion for the hydride transfer does approach the transferring hydrogen quite closely, and does appear to establish a H-bond between two hydrogens and one chlorine. 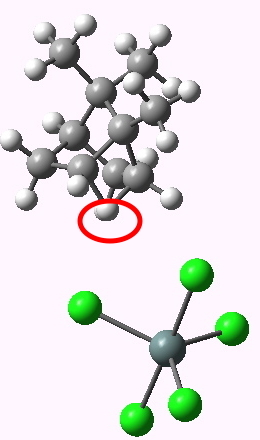 This would stabilize that structure relative to the methyl shift transition state, where such hydrogen bonds do not appear to form. In this case however, these interactions do not change the relative stabilties. 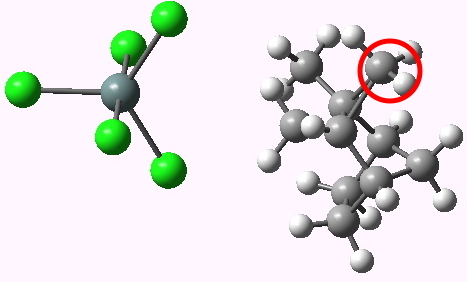 These ion-pairs do have very large dipole moments (~23D for 3, ~27D for 8), which suggests that the result might in fact be sensitive to the nature of the solvent (and presumably the counter-ion itself). Many reactions do take place in which intimate ion-pairs are formed (including a fair number of catalytic systems involving metals). We cannot generalise from the result above, but it may well be that the perturbation induced by such counter-ion may play significant roles in deciding selectivities. I would venture to suggest that increasingly modelling such as reported here will play a significant role in establishing mechanisms accounting for the selectivity of catalytic reactions. This entry was posted on Monday, January 11th, 2010 at 3:48 pm and is filed under Interesting chemistry. You can follow any responses to this entry through the RSS 2.0 feed. You can leave a response, or trackback from your own site.